At Family Pet Hospital, we are committed to our patients' dental health and implement the highest quality dental care. We take a comprehensive approach to dental care including dental health assessment, treatment and prevention. Many health problems start in the mouth. Plaque, tartar, periodontal disease, and infected teeth serve as a source of inflammation and infection for the rest of the body. Dental disease is also a source of pain. There are many ways that dog and cat owners can help their veterinarian provide a healthy mouth for their pet. Our dental services at Family Pet Hospital include teeth cleaning and polishing, tooth extractions and minor oral surgery. Who Should Examine My Pet for Dental Disease? Short Answer. 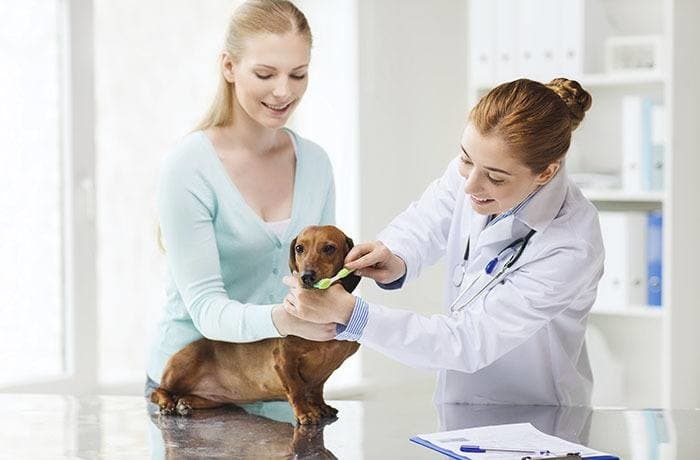 The short answer is that a qualified veterinarian should examine your pet to monitor baby teeth, eruption of adult teeth, and give a preliminary dental score to pets with all their adult teeth. Signs. Some of the signs of dental disease. Starting at their first visit, we should evaluate puppies and kittens for problems related to deciduous (baby) teeth, missing teeth, extra teeth, bite and oral development. As pets age, our veterinarians will examine your pet for accumulation of plaque and tartar, periodontal disease, and oral tumors. We perform a basic oral examination with each examination while pets are awake. However, for a definitive dental staging, anesthesia is required. Prior to the dental cleaning, the mouth is evaluated to look for loose, missing or damaged teeth. Radiographs are taken to look for disease below the gum line, and any oral masses are examined and evaluated. At this point, the veterinarian formulates a plan for creating the most comfortable mouth possible. This may include advanced endodontics, mass removal or if necessary tooth extraction. What is it and how did it start? Periodontal Disease starts out as a bacterial film called plaque. The bacteria attaches to the teeth. When the bacteria die, they can become calcified by calcium in saliva. This forms a hard, rough substance called tartar or calculus, which allows more plaque to accumulate. Early on, the relatively soft plaque can be removed by brushing or chewing hard food. The plaque leads to gingivitis, (inflammation of the gums). In this state they are red, swollen and bleed easily. Plaque develops below the gum line and eventually forms around the root of the tooth. The tissues around the tooth are damaged and the bony socket erodes, leading to a loose tooth. Ouch! Periodontal disease is an infection of the tissue surrounding the teeth that takes hold in progressive stages. Click here to see a chart of the stages. Genetics plays a role in how often your pet will need a dental cleaning. All professional cleanings require anesthetic. Your groomer is not able to clean your pets teeth … they brush the teeth. Imagine if you only brushed your teeth once every 4-6 weeks. YUCK! So what is included in a Professional Dental Cleaning? Pre-anesthetic exam and blood work. Your pet will be examined and a CBC (complete blood count) and serum blood chemistry test will be performed. IV catheter and fluids. An IV catheter will be placed to allow intravenous access and fluids to be administered to your pet to support blood pressure during the procedure. Anesthesia and monitoring. The anesthetic protocol will be determined by the pre-anesthetic blood work and exam. Throughout the procedure, a veterinary technician will monitor the patient, aided by EKG, Pulse Oximetetry, Blood Pressure monitoring as well as monitoring body temperature, heart rate and respiration. Dental radiographs. Radiographs (x-rays) of your pet’s teeth are needed periodically to evaluate your pet’s oral health and help evaluate abnormalities that cannot be detected with physical exam alone. They can also help the need of tooth extraction when teeth are loose or badly infected. Scaling and polishing. Using the same instruments as human dentists, we remove plaque and calculus from your pet’s teeth. We also polish using a special paste to smooth out scratches to the tooth enamel. Fluoride/sealants. By applying an anti-plaque substance, we help strengthen and desensitize teeth and discourage the development of future plaque. Home health care. Pet owners play an important role in their pets’ oral health. Regular teeth brushing coupled with regular dental check-ups can help your pet live a longer, healthier life. Pre-op. Sedative and pain management injections prior to the anesthesia to start the pain management. Intra-op. Induction and gas anesthesia management is tailored to your pets’ needs. When extractions or advanced dental procedure are performed, we use local line blocks to aid the anesthesia and help a smooth and pain-free recovery. Post-op. When needed, we will send home medications to aid in the recovery from dental procedures. Antibiotics. When there is advanced periodontal disease, extractions, or advanced dental procedures, antibiotics are sent home to help in the recovery and prevention of infection. Dental radiographs are used to view the dental tissues and supporting structures for the animal’s teeth. They are also used to identify problems with the crowns and roots of the teeth, as well as the jaw bones, nasal cavity and soft tissues of the mouth. They are useful for evaluating the crown and roots of teeth as well as the supporting bone and soft tissue. Even pets that are cooperative and willing to have us lift their lips and examine the teeth and gums, need anesthesia for a true evaluation. Checking for loose teeth and probing gingival pockets are not well tolerated by most pets. Radiographs are not possible when the patient is awake and are a vital component of an oral examination. Cause. There are many causes of endodontic disease; however traumatic tooth fracture is the main cause. As many as 10% of dogs have teeth with pulp exposure. Pain. A fractured tooth with pulp exposure is a painful experience for the animal; however, the pet will rarely exhibit oral pain. Since pain significantly increases when the pet chews they may stop playing with their toys, but most pets will not stop eating. Unfortunately, only very rarely will pets show discomfort. These pets are being affected locally as well as systemically, and ignoring the problem is not a viable option. After endodontic treatment has been performed on a fractured tooth, many clients report that their pet is more active and acts “years younger”. Infection. Bacteria in the dog or cat’s mouth will contaminate the fractured tooth and it will become infected. The infection in the tooth will cause a tooth abscess which results in bone destruction and eventual tooth loss if untreated. Consequently, the pulp that contains nerve tissue dies and the acute pain subsides while daily chronic pain begins. System wide effects. Animal dental infections have been linked to heart valve disease, chronic obstructive pulmonary disease (COPD), diabetes, strokes, liver and kidney disease. Discolored teeth may also be a sign of endodontic disease. On occasion, a tooth will “die” and become discolored. This is most common in canine and incisor teeth. As many as 93% of discolored teeth are non-vital and in need of treatment. Facial or jaw swelling. Endodontic disease usually causes an abscess of the root tips that can result in facial or jaw swelling. The abscess may drain through the skin or inside the mouth. Therapy. Veterinary root canal therapy is necessary to resolve chronic infections. Antibiotics may control the acute abscess, but the infection will remain and invariably the abscess will reoccur or become chronic if the offending tooth is not treated. The periodontal tissues in a dog or cat are the gingiva, alveolar bone (tooth socket), root cementum (tissue covering the root), and periodontal ligament. The periodontal ligament, composed of fiber bundles, attaches tooth root cementum to alveolar bone. Periodontal surgery in pets includes incisions in the gingiva, flap creation, bone surgery, root treatment and suturing techniques to close the surgical site. Benign masses include gingival hyperplasia, epulides, dentigerous cysts, and gingival or facial swelling caused by abscessed tooth roots. The most common oral surgical procedure performed on pet’s teeth is surgical extraction. Periodontal infection, injury, cysts, and tooth defects can necessitate surgical extraction of teeth. Dental (dentigerous) cysts may require oral surgery to remove affected teeth, excise cysts and close the wound with a gingival flap procedure. Tongue. Lacerations of the tongue can be repaired and some tumors removed. Lips and Cheeks. Trauma to these structures usually results in lacerations that can be repaired by surgery and suturing. Some problems of the lips and gingiva can be treated with oral surgery. Tonsils. Tonsilar tissue of a dog or cat can be affected by chronic infection and oral tumors that necessitate their excision. Biopsy and histopathologic diagnosis are often required to determine the cause of the enlarged tonsils. Lacerations. Lacerations of the tongue, cheeks, lips and gingiva in a dog or cat are a common result of traumatic injury to the oral cavity. If tooth fracture results from traumatic injury, the sharp edges of enamel may even cause self-injury. Lacerations are repaired to close the wounds. If fractured teeth are the cause, the veterinary dentist can treat the tooth to prevent further injury. Oral Tumors. Often surgical excision is the best treatment for oral tumors and cancer. Tumors and cancer may affect teeth, bone, or gingival. Proper biopsy may be needed to diagnose oral tumors / cancer so the best plan for treatment. Gingival Surgery. Gingivectomy and gingivoplasty can be used to reduce excessive gingival tissue. Pet owners also play an important role in their animals’ oral health. 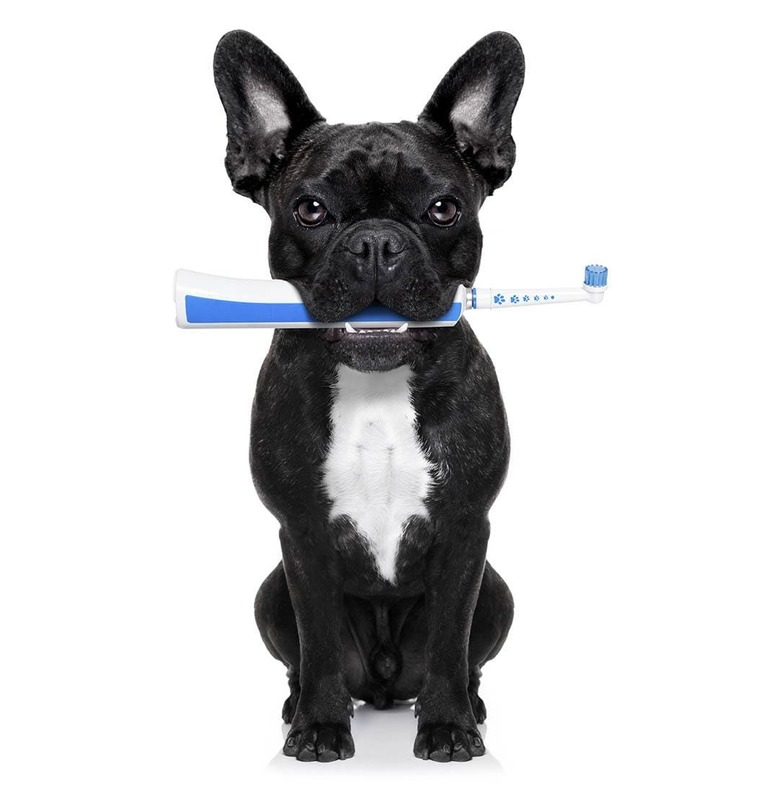 Regular teeth brushing at home coupled with regular dental check-ups can help your pet live a longer, healthier life. Brush your pets’ teeth at least two to three times per week (daily is best). Human toothpastes contain fluoride and cannot be used. Veterinary toothpastes are enzyme based rather than detergent based and are much, much safer. 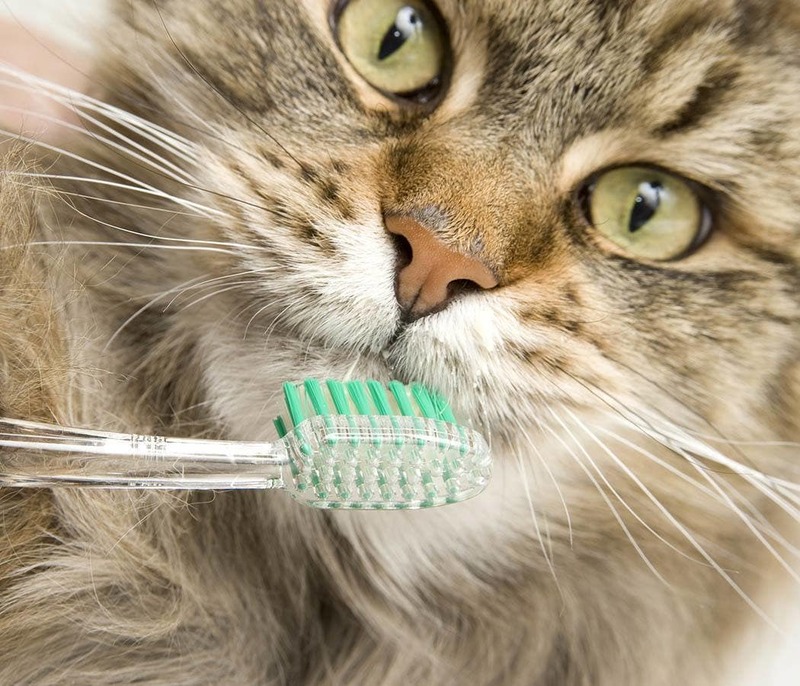 Here are the steps to effectively brushing your pets’ teeth. Start early. Begin as soon as you get your pet. Even if the adult teeth have not erupted, getting your pet used to brushing cannot begin too early. You should take a break for the 7-10 days of teething that begins around 18 weeks of age. Get your pet used to having their mouth manipulated. Using love and praise, rub the teeth and gums with your fingers. I like putting a small amount of canned food on the finger so they start looking forward to these sessions. Try to make them the same time each day, say right before dinner, and the pet will establish a routing. Use a washcloth. Put a washcloth around your finger and rub this in your pet’s mouth. Use a finger brush or soft veterinary dental toothbrush. Put a small amount of the flavored pet toothpaste (you cannot use human toothpastes) on the end of a finger brush or a soft veterinary toothbrush and hold at a 45 degree angle to the tooth. Brush gently from gum to tip. Feeding a specialized dental diet food may reduce plaque accumulation on your dog’s teeth. We can recommend an appropriate diet for your dog. Schedule oral examinations and regular scaling/polishing to aid in the prevention of periodontal disease. This should be done every six to twelve months, depending on the findings for your pet. Use of products such as toothpaste, rinse, or chews.